Say it with words. 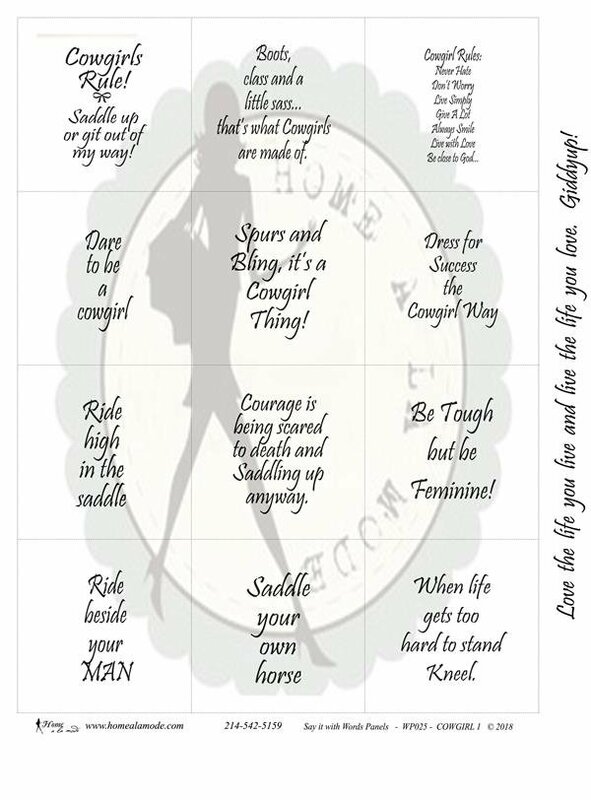 “COWGIRL” is a Home a la mode word panel that is all about being serious and sincere and also having fun with those Cowgirls.. like: Cowgirls Rule! Saddle up or git out of my way! - Boots, class and a little sass...that’s what Cowgirls are made of. - Cowgirl Rules: Never Hate Don’t Worry Live Simply Give A Lot Always Smile Live with Love Be close to God... - Dare to be a cowgirl. - Spurs and Bling, it’s a Cowgirl Thing! - Dress for Success the Cowgirl Way. - Ride high in the saddle. - Courage is being scared to death and Saddling up anyway. - Be Tough but be Feminine! - Ride beside your MAN - Saddle your own horse - When life gets too hard to stand Kneel.